Roadchix: "Hi, we're looking for the American Political Museum?" Random woman: "Oh, it's in the middle of campus, just follow this sidewalk, go up the stairs, down the stairs and you'll see it"
Roadchix: "Did she say up the stairs, down the stairs?? 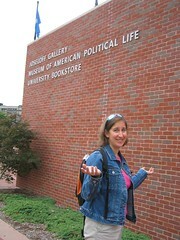 I don't see it"
Roadchix: "Hi, could you tell us where the American Political Museum is?" Random man: "It's over there on the left, just keep following the sidewalk." Roadchix: "Eureka, here it is"
Roadchix: "We're interested in seeing the American Political Museum"
Curator: "Sorry, that closed a few years back, we now house an art gallery." Note: So why did people keep giving us directions? ?